SlideShare, a sharing platform for business documents, videos and presentations, and LinkedIn have been partners for some time now. In 2008, SlideShare launched an app on LinkedIn that allows professionals to share slides and documents with their network. Because of the professional focus of SlideShare, leveraging LinkedIn’s network makes sense for the company. Today, SlideShare is deepening its LinkedIn integration, making it easier for users to share and engage with professional content on the 100 million-plus member social network. First, SlideShare has added a LinkedIn Share button, which is similar in functionality to Twitter’s Tweet button, to all SlideShare presentations, documents, and videos, so you can share content with your professional network in your stream. The button joins Twitter and Facebook buttons, all of which will be available on content both on SlideShare as well as embedded SlideShare content on blogs. 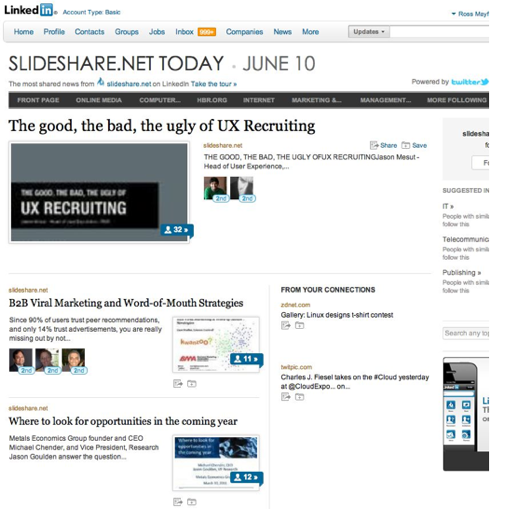 LinkedIn is also adding SlideShare content to its social news reader LinkedIn Today. As we wrote in March, LinkedIn Today aggregates the most shared news from professionals in your network. 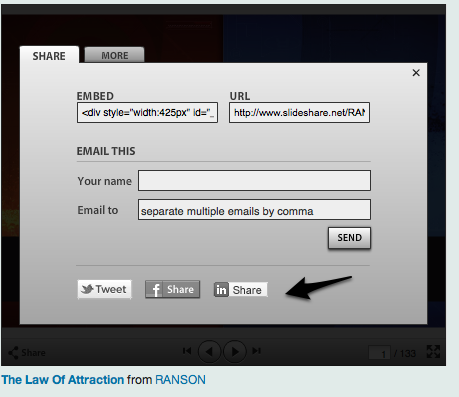 Now SlideShare content that is actively shared on the network can also be found in the news reader. And SlideShare is the first source of content in LinkedIn Today that isn’t from a publisher, but is user-generated. On the technology front, LinkedIn has upgraded the ability to view SlideShare content in the Update Stream. So if you see a SlideShare document shared in your LinkedIn stream, you can view and engage with that content by clicking on a link or thumbnail, without having to leave the LinkedIn site. Interestingly, LinkedIn and SlideShare compare their relationship to Chocolate and peanut butter for professionals. That’s also how LinkedIn described its relationship with Twitter when the network first integrated the communications platform in 2009. SlideShare and LinkedIn as partners actually make a lot of sense considering the crossover in userbase. And SlideShare is growing fast, now seeing 55 million unique visitors a month with 3 billion slides viewed each month. SlideShare VP of business development Ross Mayfield says that there are more integrations with LinkedIn to come in the future. Perhaps LinkedIn should just buy SlideShare with that boatload of cash the network recently raised in its IPO?